Months before the fight, one of the combatants, Irishman Conor McGregor, threw a steel trolley through the window of a bus carrying his opponent, Khabib Nurmagomedov. Straight after the bout, a triumphant Nurmagomedov jumped out of the ring and attacked his rival’s training partners. Welcome to the Ultimate Fighting Championship (UFC), an international mixed-martial arts competition where two “artists” of the sport (eat your heart out, Meryl Streep) fight inside an octagonal cage in front of a baying crowd. It’s never pretty – but the recent bout in Las Vegas pushed the boundaries, reigniting debate about a sport often accused of being barbaric and uncivilised. The Nevada State Athletic Commission – which withheld Nurmagomedov’s US$2 million (A$2.7 million) purse – will hold a hearing into the fight this week (October 24) to determine what sanctions, if any, should be levelled against the pair. Nurmagomedov posted an ultimatum on Instagram, threatening to leave the UFC if his team-mates face any punishment because of the brawl. Both McGregor, superstar of the UFC and one of the world’s highest paid athletes, and Nurmagomedov, the UFC’s lightweight champion, were escorted out of the T-Mobile Arena by the Las Vegas Police Department after the fight. The Russian’s team-mates were arrested but were released after McGregor refused to pursue charges. Some wondered why McGregor even agreed to such a low-purse fight after earning more than US$100 million when he boxed Floyd Mayweather in 2016. “I’m here for the love of this game, love for competition,” he explained before the fight. There seems to be a history of bad blood between him and the undefeated Nurmagomedov, dating back to a verbal altercation he had with McGregor’s close training partner, Artem Lobov, at a media event a few days before the attack on the bus in New York. That latter incident in April led to McGregor being arrested. The fight itself played out as many had predicted. 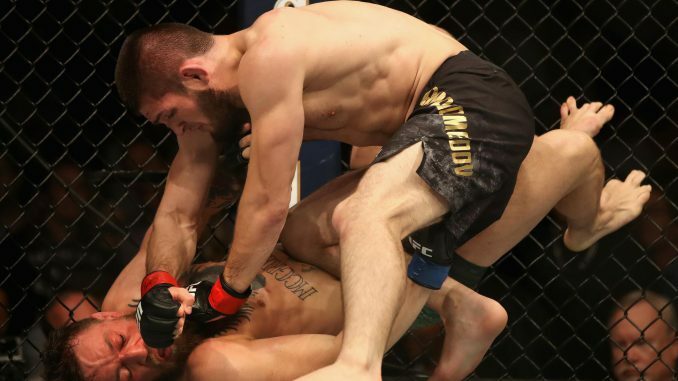 Nurmagomedov’s wrestling became too much of a force for the Irishman, and a tired Conor McGregor was submitted by rear naked choke in the fourth round. Nonetheless, McGregor did show the best defensive wrestling against Nurmagomedov that has been seen in the UFC. After the win, Nurmagomedov almost immediately scaled the cage, bounded into the crowd and attacked one of McGregor’s team-mates. One of Nurmagomedov’s team-mates promptly jumped into the cage and repeatedly punched McGregor in the head.